Terrazzine is a zinc free, transparent, fast drying seal and finish formulated for porous masonry floors like terrazzo and Saltillo tile. Terrazzine is internally plasticized to do a better job of filling the porosity of the floor, resulting in quick film formation is fewer coats. Terrazzine is designed as a one-step product, meaning no separate finish is required. If desired, Terrazzine may be top coated with a Hillyard floor polish like North Star or Endeavour. Terrazzine is tolerant of cold floors where conventional seals will not stand up. It can be applied to cold masonry, 50 degrees or higher, and its fast drying formula is perfect for grocery store aisles In the frozen food section or entrance areas in commercial buildings where cold weather can play havoc with ordinary seals. 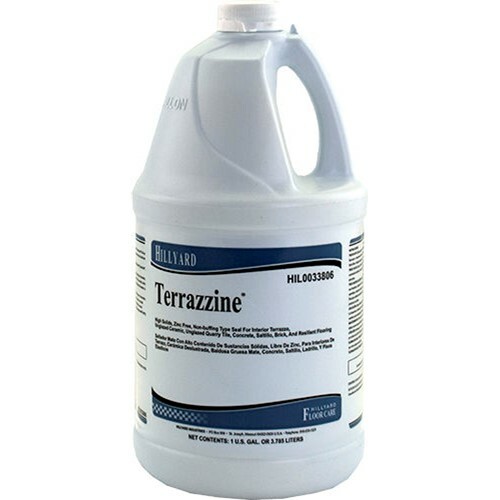 Terrazzine is easy to apply using a clean synthetic mop. It is classified by Underwriters Laboratories, Inc. as to slip resistance, 1865, and covers between 1000 to 1500 square feet per gallon, depending on the porosity of the floor. In addition, Terrazzine contains no heavy metals, a potential issue for sewage treatment facilities.